A few months ago, the cuticle of my left middle finger reddened and swelled. I bandaged and soaked and poked and fretted at the festering spot. For days it throbbed, then the pain eased after a week of antibiotic ointment. Gradually the lump and the red hue disappeared, but the fingernail puckered and pulled away from my flesh as a new nail crept out from the cuticle. The infection had cleared, but the healing skin and nail remained tender. Emotional healing progresses in a similar way. You may try many approaches to identify the cause and use a range of remedies to ease the pain. But even when the initial ache subsides, the full process to restore well-being can, and usually does, continue for a long time. Research psychologist James Pennebaker is among many who has found that writing about traumas or upheavals (what he calls emotional writing) enhances the healing process both emotionally and physically. Pennebaker shares this approach in several books, including Writing to Heal – A Guided Journal for Recovering from Trauma & Emotional Upheaval. The writing exercises he offers allow you to feel the emotions of traumatic events at the same time as your thinking brain is engaged. I’ve found such benefit in my own journaling and free-writing. Pen in hand, I give myself permission to put into words the fear, grief, loss, anger, and confusion that smolder as painfully as my finger infection. I’ve combined this writing with bookbinding in workshops called Journaling as Meditation. Participants confirm my own experience that the combination of writing and creating a handbound journal frees the spirit in powerful ways. 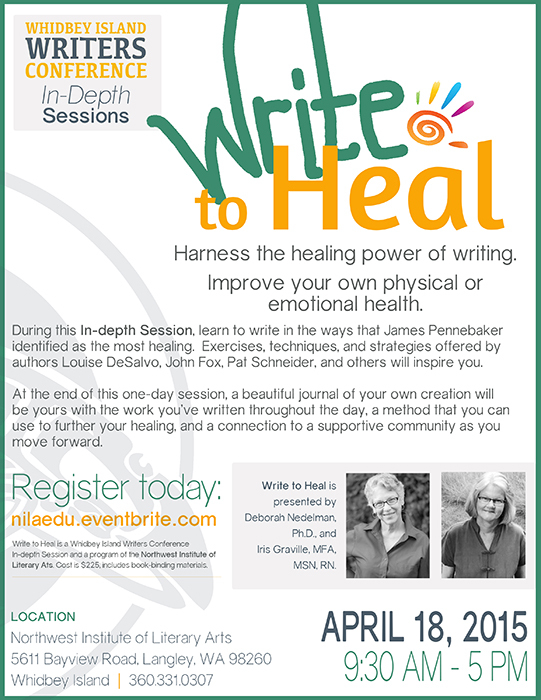 My friend and writing colleague, Deborah Nedelman, knows the healing power of writing, too. She combines her perspective as a psychologist with the work of Pennebaker and the writing approach of the Amherst Writers and Artists Workshops. Deborah and I started comparing notes about these methods back in January when my finger was throbbing. Petra Martin, from the Northwest Institute of Literary Arts, joined our conversation one day over lunch, and by the time we’d finished dessert, we’d sketched a plan for a workshop, Writing to Heal. Earlier this month, Deborah and I spent the day with nine others, writing and stitching as a way to support the fragile growth that helps wounds mend. 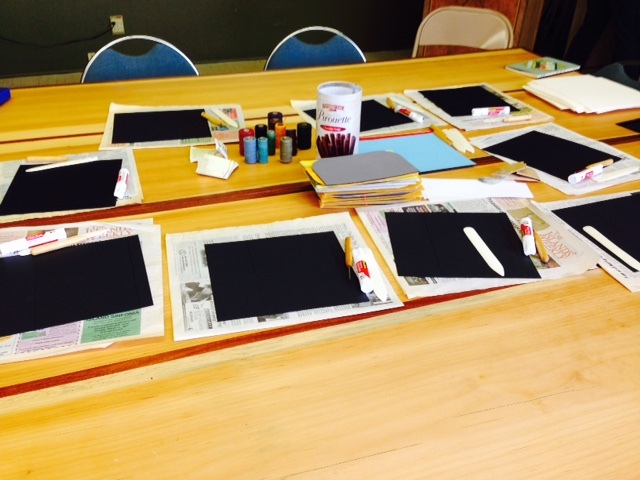 We began by making covers for the journals and folding paper for the pages to create what we view as a sacred container. Then, Deborah led participants in a writing exercise to quiet the inner critic that often appears when we’re working through difficult events. Once we wrote all the ways that internal voice might try to shut us down, we tore up those pages, tossed them in the trash, and wrote our own personal “permission slips” to write what we need to, in whatever way we need to, without worry about grammar, structure, spelling, or anything that would get in the way whenever we sit down to write. Those permission slips were available to participants throughout the day (and beyond) as Deborah led more exercises, promoting safety to move toward progressively deeper and more tender emotions. 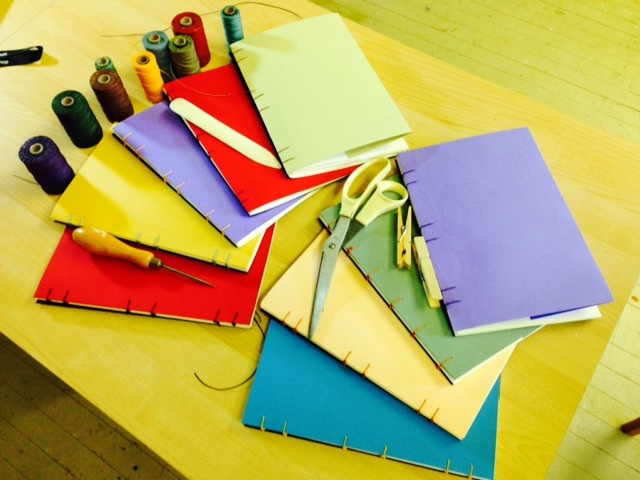 I interspersed times of stitching the pages into the journals; both the writing and bookbinding helped participants experience the emotions of the remembered event while the thinking brain and the hands were engaged in making sense of it. 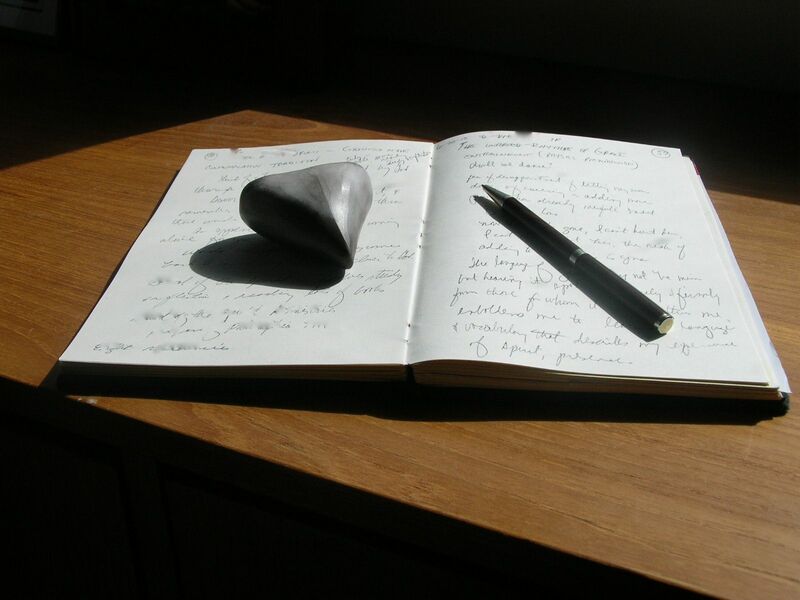 By the end of the day, participants had uncovered, in their writing, events or specific details associated with a trauma that they wanted to explore. Those who wanted to hear their own words out loud had that opportunity, too, while the group listened with care and a commitment to confidentiality. And each person left with that writing in a handbound journal that they could use to continue this work. As I packed up my bookbinding tools—awls, bone folders, curved needles, waxed linen thread—I looked at my bumpy, tender fingernail. It’s likely it won’t ever look the same as the other nails, but I expect it will be restored to new strength. It’s a fitting image of the growth that Deborah and I hope results for people who write to heal. What’s your experience of writing as a tool to heal? Nice, Iris. I’m a firm believer in writing pain out. Many pages have come while tears ran down my face. Thanks, Lorna. I know how valuable writing has been for you through emotional upheavals. I’ve also cried through many a writing session, and there were tears at the “Writing to Heal” workshop, too. Pennebaker reminds us that’s completely normal and advises taking time for yourself to reflect after doing this kind of expressive writing. A walk or some time petting my dog always help me move forward. How true, Polly; our world does indeed carry much hurt. Thanks for reading. Who does not have need of some healing in his/her life? Who would not benefit from a day to find that healing? I meant to share this earlier, in time for interested folks to sign up for my friend Iris Graville’s Write to Heal workshop. But since I dropped the ball, why not learn about this cool event now? Then you can be ready to sign up for the next one, whenever it arrives!